View some plans from this collection. 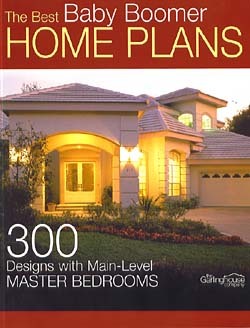 The Best Baby Boomer Home Plans offers a selection of over 300 home designs that reflect the needs and desires of those of us over forty-specifically, those of us who appreciate thoughtful room arrangements, flexible living spaces and most importantly, the placement of the master bedrooms on the main floor. This collection of home plans was gleaned from among the best home design professionals throughout North America and spans a wide range of styles and square footage. The designs are presented within square footage categories to help simplify your discovery of a plan that captures your heart and satisfies the needs of your day-to-day life within the home.